This is a remarkable disc of new and medieval repertoire for solo recorder. 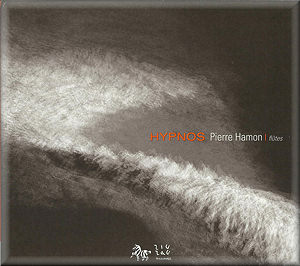 Taking its title from Philippe Schoeller’s Hypnos Linea V, the music is performed by Pierre Hamon. Schoeller’s work is peaceful, and improvisatory in style, making a feature of the expressive sound quality of the tenor recorder. Hamon’s playing is full of subtle timbral inflections, giving each musical gesture its own sense of importance within the whole. The traditional Armenian melody Dès le petit jour follows, with Hamon’s bansuri accompanied by a sitar. This is one of the most striking tracks on the album. The playing is exquisitely phrased with a sense of natural unfolding of the melody, and there is a meditative tranquillity which pervades the music. Pierre Hamon’s own Ritual 1 is an explosive and up-beat dance style work, performed on the Kuisi femelle (‘female flute’). This is an improvisation based on traditional Columbian themes. Omaggio Kogui follows, also by Hamon, performed on a lower pitched version of the same instrument and accompanied by the sombre tone of a low drum. The programme notes explain that ‘this piece is a tribute to the Kogi Amerindians who populated the Caribbean coast and withdrew to the mountains of Columbia after the Spanish Invasion’. Each of these pieces has a strong sense of identity, taking on characters through the musical language and instrument used. Ritual 2 follows, which is essentially a reprise of Ritual 1, with a second part added for the ‘male flute’. Hypnos Linea II, a second work in the series by Philippe Schoeller, was composed for flexible instrumentation, and this performance uses Bansuri, recorder, viele, lute and percussion in a multi-tracked sound, with layers building and increasing in their distortion until the end. Some improvisations on the Shepherd Song Las Estrellas de los cielos follow, with a beautifully simple introduction followed by a faster rustic dance. The medieval works which follow fit well into Hamon’s sound-world, with Guillaume de Machaut’s music played on a range of flutes with the accompaniment of drum, viele (a medieval violin), Jew’s harp and lute. The double flute is expertly demonstrated in Bele doeette/Comment qu’à moy lontaine, which combines an anonymous 13th century melody with a work by Machaut. The wonderfully rhythmic Ghaetta is anonymous 14th century Italian work in a heavy ‘istanpitta’ dance style. Al Leanzig Izabel is a sorrowful Breton song, performed beautifully on the recorder over a subtle drone. Mario Lavista’s Ofrenda is an impressive work for solo tenor recorder, which intends to explore the relationship between the instrument and its player. Using an array of contemporary techniques, including multiphonics, singing and playing and pitch bends, this is a challenging work which is impressively played here. Hamon’s expressive portrayal of the melodic lines is particularly enjoyable, with his sound possessing a natural, organic quality. Hamon is a versatile performer who creates a strong sense of atmosphere in his playing. This disc is an enjoyable array of styles which blend well to form an overall demonstration of both Hamon’s playing and the instruments he uses. This is a disc that is far from the stereotypical recorder recital; this is a disc full of soulful melodies and a wonderful variety of sounds.